The most unnecessarily overused and condescending phrase of the instructions. See ‘Step Four’ (if you can read the title) as an example. 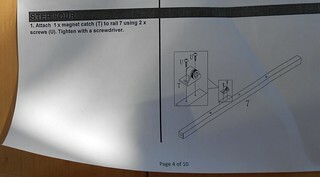 More efficient and less condescending to tell the assembler when NOT to tighten with a screwdriver – NEVER! If you’re going to use cheap photocopies of instructions, use high-contrast original colours e.g. black on white and white on black. Grey on grey becomes illegible with progressive photocopies instead of original print-outs. NEXT more emotionally expensive than IKEA, a lesson in how to look cheap. This scribble was published on Friday, October 25th, 2013. You can follow any banter on this scribble with the RSS 2.0 feed. You can share your inspired musings after typing the anti spam word near the bottom of the page. But no Pinging because its too naughty.